Those Golden Moments. For Mr. Dale Buss, the athletic achievements easily came to mind: Southern Junior High winning the State baseball championship. Girls' and boys' basketball teams doing well. Track teams winning State. Coach Bavery and the Southern High School football team beating Annawan in the playoffs when John (their eldest son) was a senior:the team scoring two touchdowns in the last two minutes to win. A coach at Rochester yelling at his kids that they were getting beat by the smallest school in Illinois. For Mrs. Donna Buss, those moments come while watching the life and growth of any young boy who goes from Tiger Scout to Eagle Scout, from a small boy hiding behind his mother's leg at the first meeting to an independent young man with a purpose. Knowing that she was part of that growth and achievement, not the reason, but a part, brings her the most joy. Sitting at the table, fish tanks humming in the background, I realized in that moment that I had been blessed with the honor of sitting across from two durable pillars in our community. Best known as the recently retired renowned West Central Elementary School Principal and the very active and also renowned Boy Scout Council Commissioner, Dale and Donna Buss have spent their lives influencing, mentoring, and developing young children into young, independent and hard working adults. 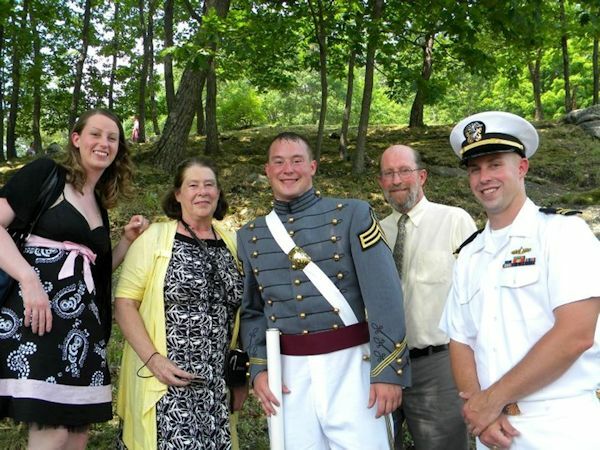 In their household alone they have raised three children in such a manner: John is a graduate from the United States Naval Academy with an Engineering Degree and now an Officer in the United States Navy; Lynn, a Registered Nurse with a Bachelor's Degree from Illinois Wesleyan; and Brad, a 2012 graduate from the United States Military Academy at West Point with an Engineering Degree and now an Officer in the United States Army. As the new school year approaches and teachers, staff, students, and community members alike adapt to a year without Mr. Buss' daily hello and smile, I felt there was no better way to honor his work than with a tribute to the effort and time both he and Donna have given and continue to give to our community. A: Dale - For me, it means to build a consensus in the direction of wherever the organization needs to go. Leadership is all based on teamwork and team effort. Donna - For me, leading is just working with others, providing any guidance they need. I like to lead by example. I do not ever ask anybody to do anything I am not willing to do side by side with them. I am looking at it more as a volunteer thing than as a boss, but it is a team thing. We are all in it together and we have to look at what our goal is: like with scouting our goal is to provide fun with a purpose. Q: To whom did you look to as a role model or leadership figure while growing up? A: Dale - A swimming coach in high school that talked me into going to college. I swam the butterfly for four years at Monmouth College. I probably still would be a carpenter if he had not talked to me. Donna - I think more in terms of generalities. For example, some of the teachers that went above and beyond. I think of this one German teacher who took twenty kids to Germany every other year that were 16-17 years old. That women deserves a medal. [I looked up to] people like that who went above and beyond what was expected of them in life. Q: Can you tell me about your background and resume? A: Dale - Born and raised northwest of Chicago, the oldest of seven boys. Father was a carpenter and mother was a school bus driver for fifteen years. Graduated from Monmouth College in 1978 with a Bachelor of Arts in Physical Education and History. Taught Physical Education, Social Studies, and Health at Southern Junior High out of college. Coached basketball, volleyball, and basketball for varying years. Later taught History and Civics at Southern High School in the morning and Social Studies at the Junior High in the afternoon. In the early 1990's, became the Head Teacher at Southern Junior High School. Received his Mater's Degree in Administration from Western Illinois University. In 1995, became the Principal of Southern High School and Junior High. During the 1995-1996 school year, became the Elementary/High School Principal. In 2005, became the Elementary Principal for the newly consolidated West Central School District. Worked for thirty-four years in Henderson County schools. Over those years his schools received three awards: 2004 Illinois State Board of Education School Academic Improvement, 2009 Illinois State Board of Education Spotlight School Recognition, and the 2010 Illinois State Board of Education Spotlight School Recognition. Also involved as Media Township Trustee, volunteer for Stronghurst Boy Scouts Program, and participant in Stronghurst Lions Club. Donna - Born in Fort Benning, Georgia, before moving to rural Illinois. Went to Monmouth College where she and Dale met. Graduated from Monmouth College with a Bachelor of Arts in Government and Sociology. First job was working for the college in admissions. "Dale got his first job here and we were going to stay for two years and move on:we just forgot to move on. This is a great place to raise kids." Worked in probation for thirteen years, admissions for seven. Works part time at Bygones and Buds, raised the kids, and "spent more time volunteering in the last ten years than working for a paid job and loved every minute of it:or at least almost every minute." Boy Scouts Council Commissioner, Cub Master and Unit Commissioner covering the area from just south of Quincy up to Muscatine on both sides of the Mississippi River. Involved in the American Legion Auxiliary. When asked about leadership positions they have held or titles/awards from their past, their combined answer for the toughest, but most rewarding leadership position either of them has experienced, they answered, "Parenting." Q: What are three things you would say to someone about life? A: [Combination Answer] 1) Donna "Always listen to your wife. "/ Dale "The wife is always right." 2) Do not be afraid to work. 3) Enjoy life because you only have it once. Do not be afraid to make mistakes-you actually learn more from mistakes and failures than you do from success. "So, what will you miss the most and what will you do with all your free time??" With a smile and a pause, Mr. Buss answered, "I am going to miss the interaction with the staff and saying hi to the kids all of the time:yeah:I am going to miss the staff and kids. It has been a lot of fun and I have enjoyed it. Now? I will play with my hobbies:look at my fish. With [my own] kids from sea to shining sea, we will get to travel. I have had to miss some of their really big moments and now we will get to share them." And then he added, "And I will be a supervisor for student-teachers at Monmouth College." Thank goodness, because throughout this leadership series, one of the main characteristics I have appreciated the most is the desire to share. Experiences. Knowledge. Anecdotes. History. Always learning, always sharing, always working to make the place around you a better one. So, thank you Mr. Dale and Mrs. Donna Buss for sharing with me and with this community as you make your way along this journey called life. Dale and Donna Buss with their three children: John (right) an Officer in the United States Navy; Lynn, a Registered Nurse and (center) Brad, an Officer in the United States Army.